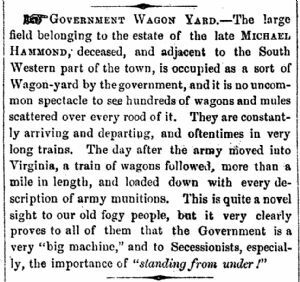 Week of July 7, 1861 - government wagon yard. GOVERNMENT WAGON YARD.—The large field belonging to the estate of the late MICHAEL HAMMOND, deceased, and adjacent to the South Western part of the town, is occupied as a sort of Wagonyard by the government, and it is no uncommon spectacle to see hundreds of wagons and mules scattered over every rood of it. They are constantly arriving and departing, and oftentimes in very long trains. The day after the army moved into Virginia, a train of wagons followed, more than a mile in length, and loaded down with every description of army munitions. This is quite a novel sight to our old fogy people, but it very clearly proves to all of them that the Government is a very "big machine,'' and to Secessionists, especially, the importance of "standing from under!"